Shannon Compton will be speaking from the book of John. His message will be “Facing Conflict With Courage.” Join us for snacks at 6 PM and worship at 6:30. Please remember to pray for the high school Dominican Republic team and the middle school campers this week. For those that have committed to pray for the high school graduates, please continue to lift them up in prayer. Everyone is invited to the VBS work party tonight from 7 to 9 PM in the blue room. Treats will be provided! If you would like to help out with VBS but are unable to volunteer, VBS is in need of a few items. Dry white rice, plastic bottles with lids (preferably Gatorade, soda, or water bottles), any kind of plastic with the number 1 recycling sign on it, toilet paper rolls, sequins, beads, and glitter can be dropped off in the welcome center in the blue tubs. We appreciate your help! Invite your family and friends to the pig pickin’ on Wednesday, July 2nd at 6 PM in the worship center. Please bring a side item and we will provide the meat. We are excited to gather together with you as we celebrate our independence! Rising 1st through rising 6th graders are invited to Kingdom Quest from July 14th to July 18th from 9 AM to 5 PM here at BCC. The cost is $95 per child but if you register by July 3rd you receive a $10 discount! 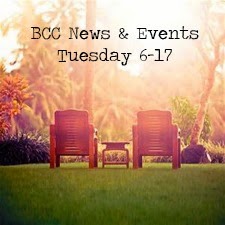 Register online at www.brevardcommunity.org and click on forms on the right hand side then click on Kingdom Quest. If you haven’t submitted your testimony please do so by visiting www.brevardcommunity.org and clicking on forms on the right hand side then click on my testimony or you can pick up a form in the rear of the worship center.